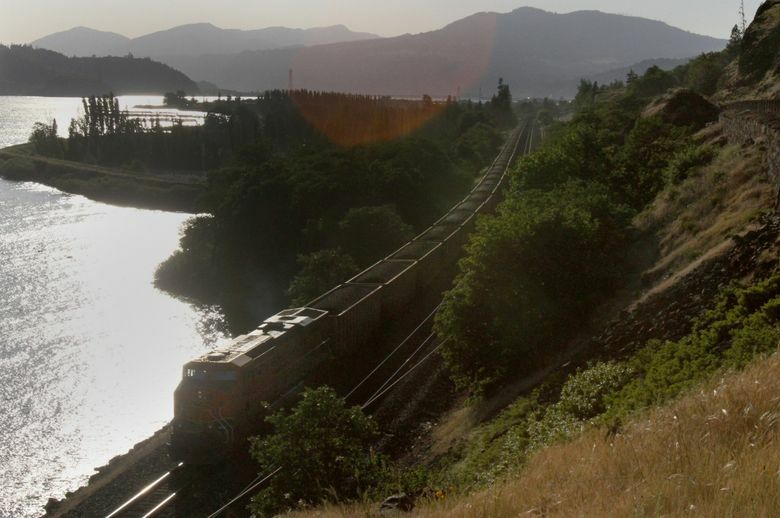 A tentative agreement has been reached between BNSF Railway and seven environmental groups that sued alleging that coal spilled from trains pollutes waterways in Washington state. BNSF Railway will study the use of physical covers for coal and petroleum coke trains as part of a tentative agreement reached Tuesday with environmental groups that sued alleging that coal spilled from trains pollutes waterways in Washington state. BNSF denied any violations of federal environmental laws, but also agreed to pay $1 million in environmental projects in the state and to clean up certain hotspots where coal has accumulated along tracks near waterways. The settlement is expected to be finalized in the next 60 days and, in the meantime, postpones a trial that began Nov. 7 in federal court in Seattle. Seven environmental groups including the Sierra Club and National Resources Defense Council sued BNSF in 2013, arguing that it violated the federal Clean Water Act by allowing its trains to discharge coal and other pollutants into state rivers and waterways without a permit. “This puts them (BNSF) on a path to the ultimate solution to stop the discharge of coal into our nation’s waterways,” said Charlie Tebbutt, lead attorney representing the plaintiffs. The agreement doesn’t necessarily guarantee that covers will be ultimately be used. But Tebbutt and others said they hoped it would lead to covers being used on rail cars, and that any such a rule would be applied beyond Washington state borders. Courtney Wallace, a BNSF spokeswoman, said Tuesday that it’s too early to tell. “We’ll have to work through the study and see what comes from that and how it would impact not only BNSF but the industry,” she said. Hundreds of uncovered trains carrying coal from Powder River Basin in Montana and Wyoming traverse Washington state each year. The trains carry coal to export terminals in Centralia, British Columbia, Canada, and other locations. Environmental groups hailed the agreement as a win and said it addresses long-running concerns about the environmental impacts of coal dust from BNSF trains. The groups had alleged that coal chunks and coal dust fall off BNSF trains through holes in the rail cars, when coal trains encounter rough tracks, or get blown from open-top rail cars during high winds or fast speeds. The coal breaks apart and contains mercury, arsenic, uranium and other toxins harmful to fish and human health, the lawsuit alleged. In a ruling in the case last month, U.S. District Court Judge John Coughenour said coal particles that fall directly into waterways from passing trains are “point sources” of pollution under the federal Clean Water Act and that BNSF could be held liable if environmental groups can show at trial that such discharges actually occurred. BNSF noted Tuesday it’s already using the best commercially available technology to address coal dust. It issued rules in 2011 requiring coal to be loaded in a bread-loaf shape and then sprayed with one of several approved topper agents or an alternative to control dust. The Surface Transportation Board upheld that rule. “BNSF has always said that we are more than willing to apply different mitigation measures if they could be shown to meet the mitigation requirements contained in our coal dust rule,” the railroad said in a statement. The groups also agreed not to bring similar litigation for five years, BNSF said.